A few commenters on my post yesterday hadn’t heard of the Commonwealth Writers’ Prize, so I thought I’d give you a brief introduction. It is one of my favourite book awards, as I have loved all the winning books I’ve read. The prize is awarded annually to the best book written by an author from one of the 53 countries of the Commonwealth. The judging is initially divided into four regions: Africa, Europe and South Asia, The Caribbean and Canada, and South East Asia and the South Pacific. with a long list and then a short list being announced before the winner is finally revealed. Note: Book short listed for Best Book is on the left; Best First Book on the right. I have a copy of Under this Unbroken Sky here and hope to read it at sometime soon. The rest of the books appeal to me too, so as soon as I spot copies in my local library I’ll be checking them out. I have read seven CWP winning books and loved them all. Creating this list made me realise how much I have enjoyed books from this prize and so I’m going to try to read a few more in the future. I already have a copy of The Book of Negroes, so will try to fit it in next month. Do you follow the Commonwealth Writers’ Prize? Are there any books that you particularly recommend? Posted in: Other, Other Prizes. Thanks for the info, Jackie! I had already googled it yesterday. I haven’t read any of the 2010 winners, I have however read three of the previous years’ ones: ‘Jack Maggs’ by Peter Carey, ‘Mister Pip’ by Lloyd Jones and ‘The Secret River’ by Kate Grenville and I was impressed by all of them. Maybe I should start reading the other winners as well. Susi, I think reading a few more is a good idea. I enjoyed Oscar and Lucinda by Peter Carey, but haven’t read any of his other books yet. I own the Kelly Gang, so will probably read that one first. I haven’t heard much about Jack Maggs, so it is good to know that you enjoyed that one. Well, ‘Jack Maggs’ is a rewriting of ‘Great Expectations’ by Dickens and even though it can stand on its own two feet, it certainly loses some of its appeal if it isn’t read as a rewriting. But that might just be me because I enjoy post-colonial rewritings immensely. Susi, I’m not sure I’ve read a re-writing before, but I did enjoy Great Expectations – you’ve intrigued me! I haven’t followed this prize, but should as all the short-listed books sound wonderful. I have read the winner ‘Solo’ though and I adored it. It’s set in Bulgaria and has themes of music and chemistry (both physical and emotional) running through it and the prose is dazzling. Annabel, I need to get hold of a copy of Solo! I was initially put off by the reference to music, as I’m not normally a fan of books that are ‘musical’, but I need to put aside my preconceptions and give it a try. In this case, I felt that the music gave the book its soul, but don’t let that put you off. The view of 20thC Bulgarian history was fascinating and the nationalising of chemical industry etc! That’s probably even more off-putting as it sounds, but really it was a brilliant book! I checked to see if my library has a copy, which it unfortunately doesn’t but hopefully it will turn up there soon. You’re a wealth of information! This is another award list I think I’ll find myself trying to work off — especially since I’ve heard of many of them, but haven’t read any of them. Coetzee’s Disgrace is already on my TBR list for this spring, so that’s a start. The fact that you’ve loved every one of the books on this list you’ve read so far speaks well for this award! Mome Rath, Thanks! I hope you enjoy your exploration into a new prize list. This award has been completely off my radar, until I received that “Read, Recommend, Review” book that has all the lists in it. When I read through the list for this award, I remembered some of your reviews. You are THE place to go for anything award-ish! Sandy, I keep thinking I should buy a copy of that “Read, Recommend, Review” Not sure it is in the UK yet, but when it is I’ll be interested to flick through and see if it is worth me buying. Stu, Glad to hear you are a CWP fan too! Thanks so much for talking about this awesome prize. It’s yet another one I didn’t know about that you introduced me to and it is now bookmarked for future reference. Lilly, I hope you find some wonderful reads from the list. Thanks for posting about this prize! These books all sound really great, I´ll look for them next time I´m going to the library. Bina, I’m sure that most of the past winners will be available and hope you have more luck with the 2010 short list in your library that I did! I’ve read three winners (the same as you have: The Slap, Disgrace, A Fine Balance–recently finished, review soon). I’m excited to see In Other Rooms Other Wonders there since it’s also nominated for Pulitzer. Just this afternoon I also just realized that Rohinton Mistry won the prize earlier before A Fine Balance. I need to read more winners from this prize! I’ve been thinking to read The Secret River for a while now. mee, The Secret River is a very good book. In Other Rooms is a collection of short stories so I’m in no rush to read that, but I hope you enjoy it. As one of yesterday’s ignorant commentors, thank you so much for the list! This year’s nominees all look quite intriguing and I recognize some old favourites among the list of past winners. Claire, LOL! It is nice to be of use. I had heard of the prize, but not really followed it. Thanks for the winner’s list. And you must read Lawrence Hill’s “The Book of Negroes” (for people in the US, it’s titled Someone Knows My Name). It was a great book and I can’t recommend it enough. I hope to read The Book of Negroes next month. It looks like the sort of book I love – a nice juicy chunkster! I really want to read Galore, even though it didn’t win! I read about it back when I was in Toronto over Christmas, and ever since then, it’s been on my TBR list! I just need to find myself a copy! Steph, Galore does look good, but it isn’t published in the UK yet. I’ll have to wait patiently! I hope you can read it soon and let me know if it is worth getting a copy. I’m a big fan of the CWP and have read five titles (Richler, Coetzee, Seth, Mistry and de Bernieres) although I didn’t realise they had won the CWP then (except for Mistry). I thought Mistry’s A Fine Balance was one of the most hard-hitting and brilliant books I’ve read, although I can’t say that I loved it because it left me depressed for weeks. But I definitely recommend it. I’m looking forward to reading Dasgupta’s Solo (I’ve seen a couple of mixed reviews). Thanks for putting up the list – it’s nice to have it all in one place! Sakura, A Fine Balance is my favourite book, so I agree with you! I don’t think I knew that most of them were CWP winners when I read them, but I will be on the look out for the other winners now. I haven’t read many of these books but I want to read them all! I love the award as it brings to attention so many wonderful books. Thanks for posting the list! Amy, I’m pleased you found it useful! I had heard of the Commonwealth Writer’s Prize but had not seen the breakdown of categories before. Do you know how they decided to put South Asia with Europe instead of with South East Asia and South Pacific? Is it the number of commonwealths? Rebecca, I’m sorry I have no idea! I assume it is something to do with the number of countries or submissions, but I couldn’t find any answers on the CWP site. The Book Of Negroes is SUCH a good book!! Monica, That is good to hear – I look forward to starting it! Jeners, LOL! I have A Suitable Boy here, but the length is putting me off too. I’m hoping to get round to it later this year, but it does require some planning to manage a book that long. I had heard the name of this award but had no idea what it was all about, so thank you for this info! I might be a potential fan too. All the shortlisted books look tempting, and I’ve loved the three winners I’ve read so far: A Fine Balance, Eucalyptus and Disgrace. I’m a bit surprised but happy to see Eucalyptus in winners list. I think it is a nice and charming book. The plot is like one from an old fairy tale written in a more modern form – but not too modern! Satu, I haven’t heard of Eucalyptus other than by its title on this list. It is nice to know a bit more about it. I’m not sure it really appeals, but I think I might try to read all the winners of this prize at some point, so I’m sure I’ll get to it one day. Thank you for the post which also highlights some books which were unknown to me! Thanks for the info, Jackie. I didn’t know about it. I am off to check out these books. Andreea, I hope that you find some that you enjoy! I’m not actively following the prize but I think it’s one that I’ll pay closer attention to in the future. I’ve read five of the winners and have another on-hand (The Book of Negroes) as well as one from this year’s shortlist (In Other Rooms, Other Wonders). Claire, Let’s hope we both enjoy the Book of Negroes! Thanks for this post! I wasn’t aware of this award before, but it will definitely be on my radar from now on! The only problem now is that American libraries and bookstores don’t have these books yet, so I’ll have to order them!!! Rebekah, Don’t worry – half aren’t published in the UK yet either! It is quite nice that they are all published in different countries around the world – it means none are available to all, so we can all experience that longing for a book we can’t yet have! Those books all LOOK gorgeous, don’t they? I’ve only read True History of the Kelly Gang from the list but recommend it heartily all the same. tea lady, It is good to hear that you enjoyed the Kelly Gang – I hope I do too! Ashamed to say that I have only read A Small Island and Captain Corelli although I have copies of five of the others, all unread, on my shelves and have been seriously considering buying The Book of Negroes because it looks fascinating. I really hate the way publishers change the names of books, not just between countries but even between editions for no good reason. It’s really annoying when you request books from a library thinking that you haven’t read them only to discover that you already have but under another name! I have to confess my ignorance as well. I had also never heard of the Commonwealth prize but appreciate learning about it via your blog. I was interested to see Mistry on the past winners list for a book I’ve not heard of before. I love A Fine Balance and have Family Matters checked out of my library right now and am hoping to read it before it has to be returned. This looks like a nice, eclectic list. 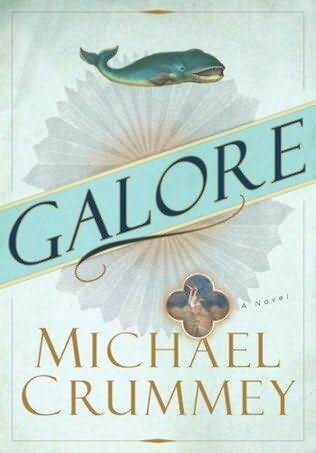 I’m really wanting to read the Michael Crummey as I keep hearing about him in these parts but have never got around to reading. Thanks for the information on Commonwealth writersprize, but why didnt you include Chimamanda Adichie”s Purple hibiscus that won the prize recently? when willthe 2011 entry forms be published? Glad to get your reply. Purple Hibiscus won the Commonwealth Best First Book of the Year: 2005. This is the award given to the best book by a debut novelist. The list in my post is for the overall winner of the Commonwealth Writers Prize each year, which was Small Island in 2005.
in the next few weeks.